Monarchs. They’re practically honorary birds – beloved, much written about, rather visible and charismatic in their stripey larval form and spectacularly so as vivid orange and black adults. And the subject of earnest conservation-related concern as habitat loss, pesticides, and the like cause their population numbers to trend down, down, down. So it’s no surprise that this year’s population boom in monarch butterflies has caused delight across New York State, from the Olde Homestead – where my mother delightedly described finding more caterpillars in a single day than she did all last summer – to Queens, where migrating beauties have been fluttering high above my balcony, earnestly headed southwestish, for days. Their abundance this summer may not be enough to herald a comeback – and the western populations of the species, in particular, are still facing major trouble – but it was a welcome sight for any nature lover nevertheless. 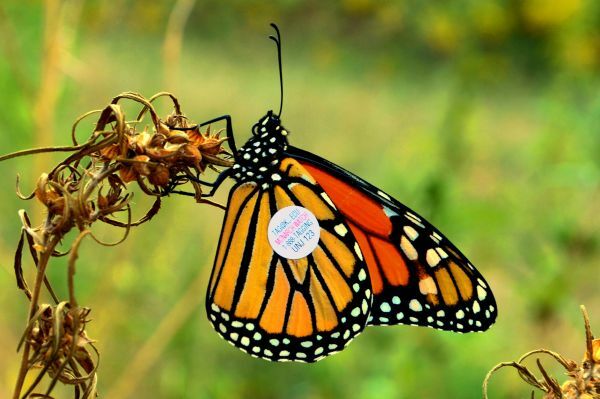 But while monarchs are among the most charismatic and well-studied of lepidopteran migrants, rather less attention is paid to the fact that North America is home to other migrating butterflies. Colorado saw a newsworthy painted lady incursion this fall; the closely related red admiral also migrates (it’s interesting to note that in Europe, the painted lady seems to be almost as well-known and well-documented a migrant as the monarch is in North America.) The American snout periodically moves through Texas and Mexico in huge numbers. Cloudless sulfurs stay east and winter in Florida. Typically birders are most attentive to butterflies in the summer months, when birding can get a bit dreary and repetitive. But it turns out that they are well worth noting in the spring and fall as well.